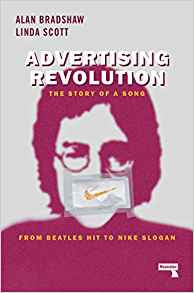 Advertising Revolution will reawaken negative feelings in many Beatles fans who were outraged by Nike’s 1987 trainers advert incorporating the tune of ‘Revolution’, John Lennon’s first politically-charged song. Excessive capitalism and consumerism were the hallmarks of the 1980s with the birth of the ‘I want it and I want it now’ easy credit, it’s all about me, generation. But Nike wasn’t the first company to harness the power of rock music to sell a product. That dubious honour belongs to Levi Strauss & Co and three West Coast American bands, most notably, The Jefferson Airplane, who agreed in 1967 to do music commercials for Levi white jeans. Grace Slick did withdraw the band’s support (too late ‘though) after she was informed by activist Abbie Hoffman that the Levi Strauss workers in Georgia/Tennessee were then currently on strike over pay and working conditions. By the 1980s, it seems that very few people were pointing out that some of their fashionable sportswear might just haven been made in Asian sweatshops. So how did this happen when we know that the former Beatles were opposed to their music being used this way? Simply, Yoko said yes. Paul, still simmering over Yoko not coming in with him to buy the Beatles back catalogue (bought by Michael Jackson instead), said it was up to her because it was a John song. That left George and Ringo fuming and Apple filing a lawsuit against Nike, Capital and EMI. It was all not very ‘sporting’! All in all, what heartens me about this book is that it unintentionally reminds us that there is just something rather nasty about using a song-concept like ‘Revolution’ by a cherished music group to sell falsely-trendy, artificially-overpriced, labour-exploitative gym shoes!